Every afternoon, the Asia section of Animal Kingdom comes to life with the Bhangra Dance Party. 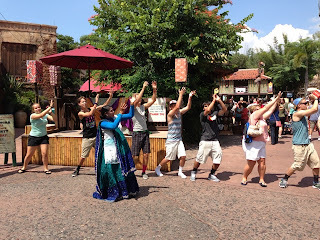 Bhangra refers to a type of dance originating in the Punjab region of India. There is a DJ and several dancers, dressed in traditional Indian costumes, who lead willing guests through many different moves. The music has a very strong "electronic" beat and it definitely draws guests in as they walk by the very busy corner near the Yak and Yeti restaurant. I took this shot yesterday, shortly after my tour guests enjoyed Kali River Rapids. I have been enjoying the Buzz Lightyear attraction at the Magic Kingdom for more than a decade. However, I just recently started learning some of the tricks to getting a good score. The highest possible score you can get is 999,999, and I had gotten close on several recent tries. 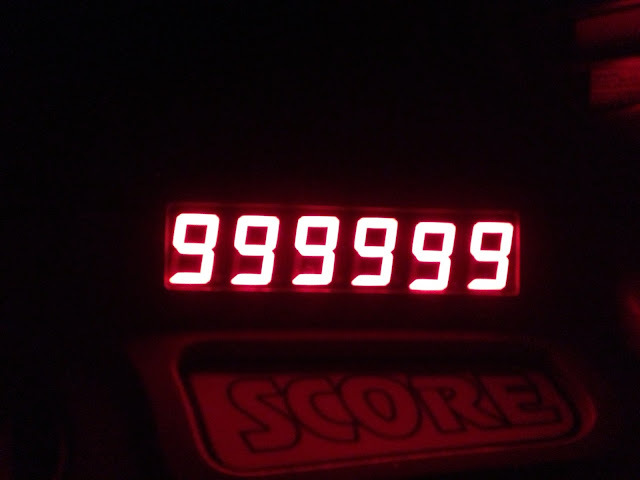 Yesterday, while riding with a five year old tour guest, I finally did it. My next challenge is to figure out how to get a good score on Toy Story Mania at Hollywood Studios. Today is the two-year anniversary of the "Picture of the Day" section of Digital Disney World. While touring the Magic Kingdom today, I thought it would be appropriate to take a picture of the entrance area. This is the most photographed spot in the entire world, so it makes sense to use this as the milestone shot for a blog dedicated to pictures of Walt Disney World. I also want to say a huge thank you to everyone who has enjoyed Digital Disney World over the past few years. The blog had its 90,000th page view this week, and I appreciate so many people taking the time to check it out. Sharing my passion for Walt Disney World using this website is a fun hobby, and I hope to continue doing it for many years to come. Thanks again! Disney has been adding "interactive queues" to many of their standby lines. 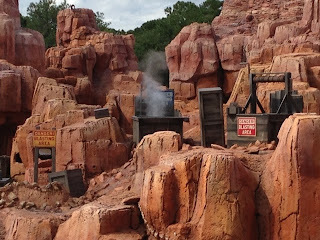 The makeover in the Big Thunder Mountain queue is one of their more recent ones. They have really embellished the whole "gold mining" backstory with signs and props throughout. The best addition, however, are the dynamite plungers that guests can actually use to detonate explosives on the mountain. This shot, that I took last night, was of one such explosion caused by my son. It was 49 years ago, today, that Mary Poppins had its world premiere at Grauman's Chinese Theater in Hollywood. It is appropriate that this film is part of the Great Movie Ride at Hollywood Studios, which is housed in a full scale replica of the Chinese Theater. Julie Andrews won the Academy Award for best actress for portraying Mary Poppins on the big screen. There were also several academy awards for the music in the film, which was written by the Sherman Brothers. The Sherman Brothers music can also be heard in several great Disney park attractions, including "it's a small world" and "Walt Disney's Carousel of Progress." I took this shot of the Mary Poppins scene in the Great Movie Ride a few weeks ago. I spent a few hours over at Animal Kingdom today for a little "hidden Mickey" research. There are literally dozens of these to be found inside Conservation Station at Rafiki's Planet Watch. The imagineers were very creative in placing these Mickeys throughout the building. Many of them are in the amazing mural of animals that is found in the entrance area. Even if the subject of conservation doesn't seem particularly interesting to you, it is worth coming to this location to see the hidden Mickey's. The Wildlife Express train that takes you to Rafiki's Planet Watch is almost an attraction unto itself. I snapped this shot just before boarding to return to Harambe Village in Africa. Today, I had the opportunity to try out The Great Piggy Bank Adventure at Epcot with my son. This exhibit is located in Innoventions West and is presented by the investment management company, T. Rowe Price. This is an appropriate sponsor, as this "game" is based on teaching kids how to save money. Truthfully, this experience is really more of a series of hand-eye coordination exercises than an education about savings. However, it is still a fun activity that introduces young guests to the concept of investing for the future. I visited Coronado Springs Resort today. This very large hotel has nearly 2,000 rooms situated in three different sections. There is a lake in the center of the property called Lago Dorado. I snapped this shot of the registration building from across the lake. I had the chance to enjoy Walt Disney's Carousel of Progress tonight for the first time in a while. It is a classic attraction with historical significance. Aside from being the longest running stage show in American history, it is also the only attraction at Walt Disney World that Walt actually "touched." Even though young kids may find the show a little boring, it is still something that every family who visits the Magic Kingdom should experience at least once. This shot shows one of the six theaters that rotates around the stage. Each one contains 240 seats. A few days ago, we took the Magic Kingdom Ferry to the Transportation and Ticket Center. We were on the top level as we approached the dock. My son and his cousin yelled: "Hidden Mickey!" at almost the exact same time. Sure enough, when I looked over the railing, I saw this rope on the left side of the dock. The Chapeau is the "hat shop" in Town Square at the Magic Kingdom. It is one of the few places where you can still have a name embroidered on Mickey ears. My wife purchased a set of ears for our 2 year old nephew from this location on Saturday. Every kid should get a personalized set of Mickey ears from the Magic Kingdom at some point in their childhood. I had the opportunity to swim in the Port Orleans - French Quarter pool this afternoon. We were visiting my sister and her family who are guests at the resort. I was very impressed with the size and theming of this location. My son and his cousin loved the "sea monster" slide, and we all had a great time. I got this shot of the "parking and maintenance" area while riding the Tomorrowland Speedway with my son today. This opening day attraction has been a fixture in Tomorrowland for over 40 years. Each of the 146 cars are powered by 9hp Briggs & Stratton engines. Each car is currently valued at approximately $6,000. While visiting Epcot with family today, we spent a good amount of time in The Seas with Nemo & Friends. We caught a dolphin presentation that showed how smart these animals are. At the end of the "show," the two dolphins smiled and took a bow. It is always fun to see one of these added experiences that pop up throughout the day. It was a fun day visiting the Magic Kingdom with my sister and her family. While riding The Many Adventures of Winnie the Pooh, our honey pot temporarily stopped in front of the birthday scene. This gave me a great opportunity to snap this shot. Most of the time, my photos from this attraction come out slightly blurry due to low light and the motion of the ride. This is a good example of why its great to have a cell phone with a decent camera. You can point and shoot within seconds of seeing a good photo op! I don't often get the chance to get on the Wildlife Express at Animal Kingdom, but today my family decided to make the trip. This train deliver's guests to Rafiki's Planet Watch, which is home to Conservation Station. While visiting this spot, we saw a cheetah getting a dental exam in the veterinary treatment section of the building. It was fascinating to see this procedure being done. I met my tour guests at the Contemporary this morning, after they enjoyed breakfast at Chef Mickeys. Prior to meeting them, I took this shot out of the back door of the conference room level. You can see Bay Lake Tower to the left, as well as Bay Lake itself. It is a very nice view, especially on a quiet morning. Today, I had the opportunity to enjoy Turtle Talk with Crush at Epcot. I was touring with a family of seven from Australia. Since it was the first show of the day, the theater was nearly empty. One of my guests had fun talking with Crush during part of the show. I always enjoy riding Tower of Terror, but today I decided to see if I could get a shot from the 13th floor. I was with my tour guests from Australia, who were riding for the first time. The elevator stopped just long enough for me to quickly snap this photo. Needless to say, I had a quite a grip on my iPhone. There was a pretty big controversy when Disney decided to transform the Main Street Bakery into a Starbucks. However, now that it has opened, I have to admit they did a good job with the theming and I don't think that the modern coffee company takes away from the old-time Main Street feel. They have even created a backstory to explain how this coffee found its way into that location. Ishmael Pike was the proprietor of the Main Street Bakery. He traveled the world in 1897, where he tried different coffees. He found areas where the best ingredients were grown and eventually brought coffee to Main Street. This is how the bakery turned into more of a coffee shop. I took this picture of Ishmael Pike today, after enjoying a venti ice coffee. I got this shot just after Animal Kingdom opened this morning. If you look closely, you can see an empty train stuck on the hill to the left. Although the ride wasn't working right at park opening, they quickly got it fixed for thousands of guests to enjoy. I grabbed some FastPasses right after I took this photo, and my tour guests enjoyed the attraction just before noon. Storybook Circus took over Mickey's Toontown Fair a little over a year ago. The two major attractions are Dumbo and The Barnstormer, but there are other good reasons to visit this area. One of them is Storybook Treats, which is a large gift shop and snack bar underneath a giant circus tent. The other night, I shared this giant cookie from this location with my wife and son. It was delicious! I had the chance to swim in "The Big Blue Pool" at the Art of Animation Resort with my son today. Although I had heard about the underwater speakers, I can report that there really was music being played inside of the pool. They were all "water" related tunes like Surfin Safari and Wipeout. This is a great resort with a very unique pool. I was leaving Epcot tonight just as Illuminations was starting. I was able to snap a quick shot of Spaceship Earth with fireworks lighting up one side of it. This certainly wasn't the best place to watch the fireworks, but it was an interesting view and I couldn't resist taking a photo. I got a unique shot of the General Joe Potter ferry boat tonight as I was passing overhead on the monorail. The boat was in the passageway between Bay Lake and the Seven Seas Lagoon. It was coming from the maintenance area at the north end of Bay Lake. You will only see the ferries in this area once in a while. Typically, they travel back and forth between the Transportation and Ticket Center and the Magic Kingdom. Here is a unique shot of Cinderella Castle that I got the other day. I was riding on the Tomorrowland Speedway with my son at the time. He was driving and I was snapping pictures as we made our way around the 1/2 mile track. This photo was taken on the bridge, which is probably the highest point on the track. We watched Wishes from the beach at the Polynesian Resort last night. Other than a private fireworks cruise, this is probably the best view outside of the park. If you look closely, you can see Cinderella Castle at the bottom of the picture. It is lit with a pinkish hue during Wishes. Tonight we had our first chance to see the new volcano atop the Rainforest Cafe at Downtown Disney. It was an impressive sight. Every half hour it bursts into flames and creates quite a spectacle. It certainly draws everyone's attention toward the restaurant, which I'm sure was the intention. I had the opportunity to experience Enchanted Tales With Belle at the Magic Kingdom for the first time in a while. The wait was only about thirty minutes this afternoon so I decided to visit with family and friends. I was chosen to play the part of a knight and my wife was selected to be Wardrobe. We enjoyed our roles and look forward to returning in the future. Catastrophe Canyon is the highlight of the Backlot Tour at Hollywood Studios. Although I didn't ride it today, I had a unique view from "above." We were getting ready to enjoy Lights, Motors, Action from the top row when the natural disaster sequence began at the canyon. I was able to snap this shot looking out of the back of the stadium bleachers. It was fun to see how the huge tanks of water unloaded over the tram below. Approximately 70,000 gallons of water are used to simulate the flash flood. The "Leap Frog Fountains" have been outside the Imagination pavilion since way back in the early 1980s. However, they still entertain fans today. It is fun to watch kids (and adults) "catch" the water as it jumps from spot to spot. I snapped this shot shortly after enjoying Captain EO with friends and family today.